Patient's of Dr. McKlindon, D.D.S. For most people, raising kids is an expensive proposition. (A recent estimate by the U.S. Department of Agriculture puts the average tab at almost a quarter of a million dollars before they turn 18.) But if you’ve been keeping up with parenting news lately, you may have come across an even more jaw-dropping fact: According to a survey by the Sunstar group, a maker of oral hygiene products, when the tooth fairy makes a pickup in New York City, she (or her parental surrogate) leaves an average of $13.25 per tooth! That compares to $9.69 per tooth in Los Angeles, $5.85 in Chicago and $5.02 in Boston — and it’s a far higher rate than most other polls have shown. But it brings up a good question: What's a baby tooth really worth? Ask a dentist, and you may get an answer that surprises you: A lot more than that! 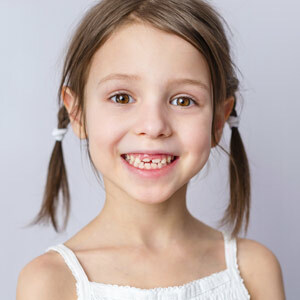 Primary teeth play the same important roles in kids’ mouths as permanent teeth do in the mouths of adults: they allow kids to bite and chew effectively, speak normally and smile brightly. Their proper functioning allows children to get good nutrition and develop positive social interactions as they grow toward adolescence — and those are things it’s difficult to put a price tag on. But that’s not all baby teeth are good for. Each one of those little pearly-whites serves as a guide for the permanent tooth that will succeed it: It holds a space open in the jaw and doesn’t let go until the grown-up tooth is ready to erupt (emerge) from beneath the gums. If primary teeth are lost too soon, due to disease, decay or accidents, bite problems (malocclusions) can develop. A malocclusion (“mal” – bad; “occlusion” – bite) can result when permanent teeth don’t erupt in their proper locations. “Crowding” is a common type of malocclusion that can occur when baby teeth have been lost prematurely. The new, permanent teeth may come in too close together because neighboring teeth have shifted into the gap left by the prematurely lost tooth, creating an obstruction for the incoming teeth. In other cases, the permanent teeth may emerge in rotated or misplaced positions. Bite problems make teeth harder to clean and thus more prone to disease; they may also cause embarrassment and social difficulties. The good news is that it’s generally possible to fix malocclusion: orthodontists do it every day. The bad news: It will almost certainly cost more than $13.25 per tooth. Alternatively, baby teeth in danger of being lost too soon can often be saved via root canal treatment or other procedures. We’re not advocating giving big money to toddlers — but we do want to make a point: The tooth fairy’s payout: a few dollars. A lifetime of good checkups and bright smiles: incalculable. If you have questions or concerns about baby teeth, please call our office to schedule a consultation.